Join the Office of Diversity, Equity, and Inclusion in a continuing celebration of indigenous queer and trans identities during Native American Heritage Month. 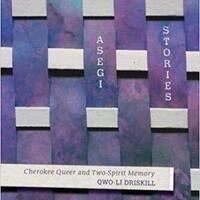 We will be discussing Qwo-Li Driskill's "Asegi Stories: Cherokee Queer and Two-Spirit Memory." Students who are interested in this event can obtain a complimentary copy of the book by stopping by ODEI in Lower Gund Commons 012. While ODEI has a limited supply of complimentary copies, a free e-book of this text is also available through Kenyon's LBIS website. Light refreshments will accompany the lively conversation about the importance of two-spirit history and cultural awareness.